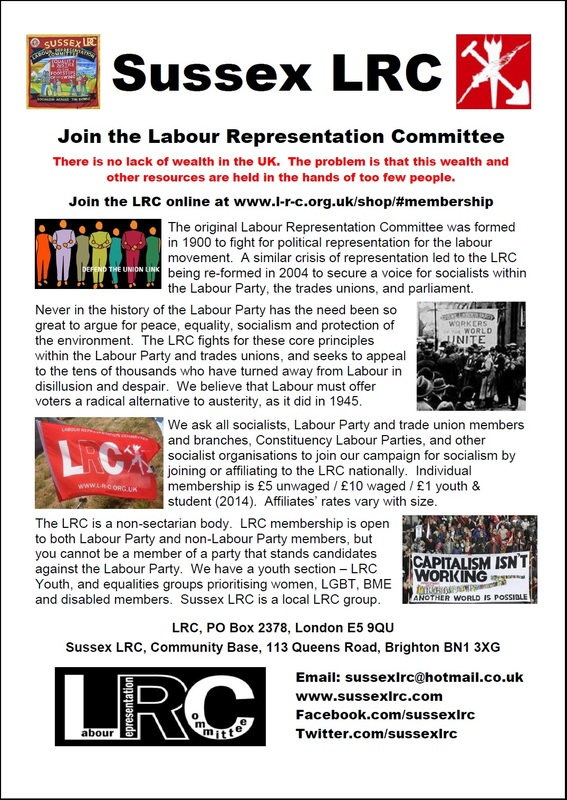 This is an exciting time to join Sussex LRC – we are continuing to grow rapidly as Labour supporters, trade unionists and other socialists look to develop a radical agenda around which the labour movement can unite to rid ourselves of failed austerity policies and so reverse the sustained attack on wages and living standards, the like of which we have not seen since the 1860-70s. Truly it seems that the Tories are determined to take the UK back to Victorian times. The LRC has other local groups, like this one, right across the country, bringing together socialists and trade unionists to fight local campaigns. The LRC is a non-sectarian body. LRC membership is open to both Labour Party and non-Labour Party members. However, you cannot be a member of a party that stands candidates against the Labour Party. Joining the LRC costs £1 youth or student / £7 unwaged / £14 waged and is open to members of the Labour Party or to those who are members of no political party. Got any friends out here in Wealden? The Left here is feeling lonely! We encourage sisters & brothers in the Wealden area to get in touch with Tom. While we can’t release membership data publicly (or we’ll have the Information Commissioner after us!) we know that he’s not alone in the wilds of Wealden. Sussex LRC is proud to have had a strong Uckfield influence since our founding.